AMBITION, CORRUPTION, FOOLISHNESS, IMPOSITION, PLUNDER, AGGRESSION, IRRESPONSIBLE DEBT AND COLLECTIVE IRREVERSIBLE ENVIRONMENTAL DAMAGE, ARE THE CONSTANTS IN PRELIMINARY WORKS FOR THE CONSTRUCTION PROJECT OF THE NEW AIRPORT IN MEXICO CITY. 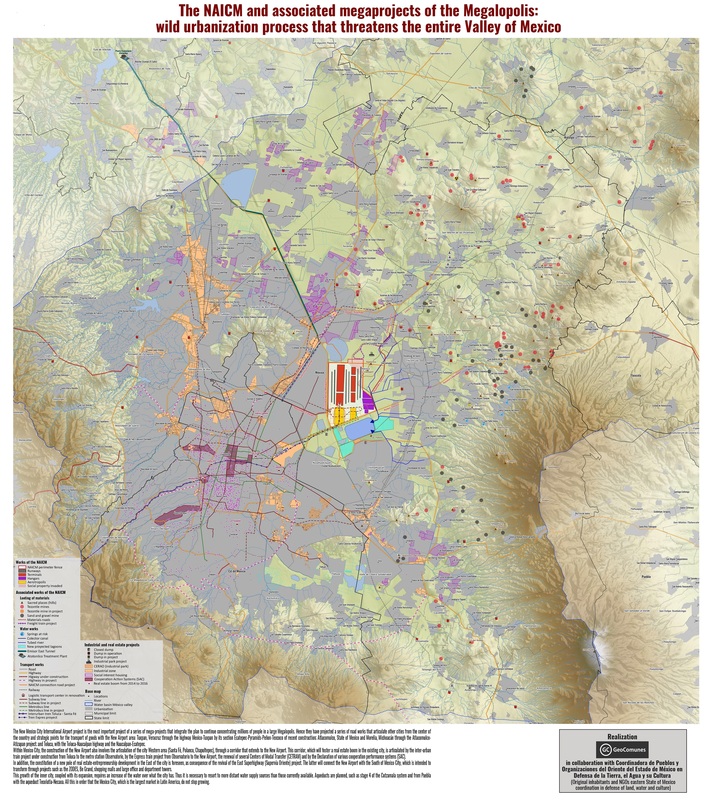 In order to start the construction of the New Mexico City International Airport (NAICM) on the bed of the historic Texcoco Lake, several associated works have been developed, such as highways, railway, river canalization and land granting for industrial parks, housing units and shopping areas. Likewise, new roads are being opened in farmland ejidos and on the banks of the San Juan and Papalotla rivers, which has involved removal of a large number of mature trees to expand the already existing rural roads and allow the entry of thousands of trucks and trailers which introduce materials such as volcanic rock (tezontle), teyolote, tepetate and stone extracted from the destruction of hills throughout Mexico’s Valley, in an attempt to replace the lake natural soil, destroying its nature, its biodiversity and its regulatory function of temperature (Climate Change), rain water and runoff from the higher parts of the Valley; in addition to affecting the residents of nearby communities, stripping them of their property and demolishing their houses, causing a forced displacement of families, destroying their patrimony and putting at risk their food, housing and economic security. In addition, sprinkler irrigation network systems are being installed on the ejidos, that reach the perimeter of works prior to the construction of the New Airport as the perimeter wall, pretending to be in support of farmers but which in reality aim to deprive communities of the irrigation water flow from wells to benefit developers of housing, industrial, hotel, commercial, etc., as well as impacting parceled grounds of the river side communities. In a very few days, were have witnessed and documented the drastic landscape alteration in the area of Texcoco Lake by the works for the New Airport, mainly due to indiscriminate tree cutting, the introduction of pipelines, houses demolition, destruction of wells for agricultural irrigation, the canalization of rivers, the severe ecological damage caused by the construction of the highway Mexico-Tuxpan in the section Ecatepec – Pyramids–Peñon-Texcoco and the development of railroad tracks that is expected to accelerate the introduction of thousands of tons of stone materials from the devastation of the hills, which daily are transported and emptied to cover the fertile soil, vegetation, and the water patches of the lake, destroying life of endemic plants and animal species, the cultivation of healthy food and ancestral nutritional treasures such as Spirulina, the sanctuary of migratory birds, the remnants of the prehistoric remains considered by renowned archaeologists unique in the world and the tranquility and subsistence means of the native population today being attacked, intimidated and submitted through the use of public force and the PRI paramilitary group “antorcha campesina”. 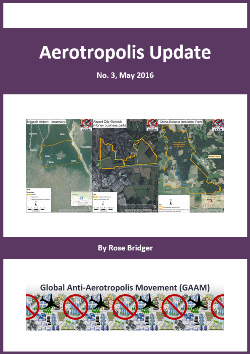 For over 4 years, our non-partisan and anti-capitalist organizational effort, a member of the Indigenous National Congress-CNI, of the Global Action against Airport Projects and Aviation Expansion and the World Social Forum-FSM, has conducted forums, colloquiums, seminars, cultural festivals, itinerant work meetings, press conferences, radio interviews, videos and publications that contribute to the spreading of the problem and to sensitize the population on the infeasibility and illegality of this mega-project of death, as well as the real very high risk of hydric system collapse and the affectation level throughout the Valley and center region of the country, including Mexico city. 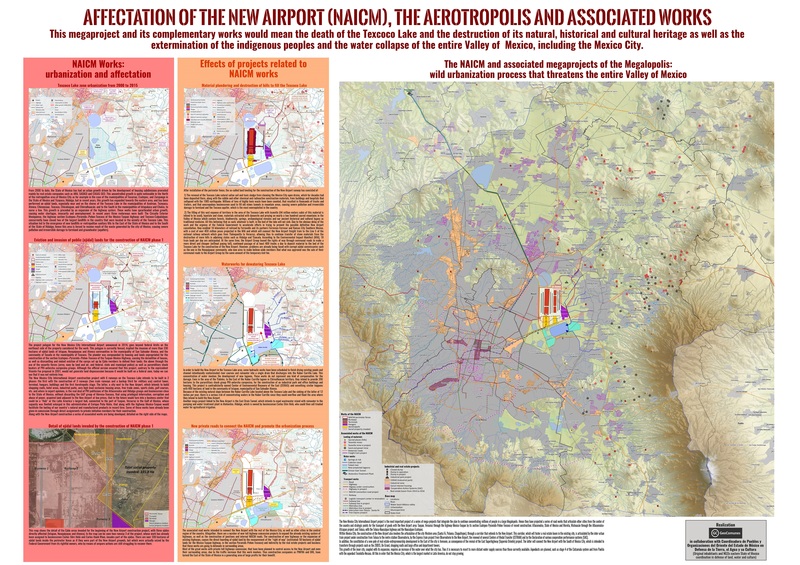 While in countries of the first world, their airports have only 2 runways and Austria celebrates the final cancellation decision of the Vienna airport third runway on the basis of the fight against climate change, the New Airport in Mexico is projected to have 6 runways, so that while some function others undergo maintenance, which explains the folly and interest to do so in the Texcoco Lake, for the benefit of companies linked to the large transnational conglomerates involved in the project and to political power groups. We make an urgent appeal to all society sectors in Mexico, Latin America and the rest of the world, to massively pronounce in defense of life and heritage of Texcoco Lake and of the peoples and communities that depend on it; because as people we cannot agree on such a project that is due to decisions of the high corruption in Mexico, that could even point to shady dealings and that should not be built in any part of our country. You can help us to stop the largest ecocide in Mexico and Latin America by sending letters, e-mails and twitters and/or making phone calls to responsible government instances, to demand the definitive cancellation of this mega-project of death. 2) The advance of the devastation on the vegetation and the lake, in the background the Cerro de Chiconauhtla threatened in principle with cut it lower 40 meters in height by clogging the overflight of aircraft but could be blown up and pillaged in its entirety. 3) Indiscriminate felling of trees by staff of the companies hired by the Grupo Aeroportuario, introduction of pipelines, transit of trucks and trailers. 4) Machinery in the area of Texcoco Lake, implementation of a white powder (chemicals) to the fertile land. 5) Recent View of Texcoco Lake, migratory birds and in the background the perimeter fence of the New Airport which is adjacent to the highway Peñón-Texcoco to which are intending to connect the expressway Mexico-Tuxpan highway in its tier Ecatepec-Piramides-Peñón-Texcoco by dividing communities, dispossession them and destroying everything in its path: arable land, agricultural irrigation wells, trees, animals, etc.